What is the true thing called Psychology? science of the soul or understanding of the mind. Since its Greek origin, psychological is the branch of metaphysics that studies the soul, called in English the mind, and the soul relationships with the functions of the body as the animating force of life. This ancient discipline has been thus constructing, over the centuries, and has been consolidated as a scientific knowledge, a discipline and a craft, to reach specific understanding of the factors driving - 'behind the scenes' - one's life and also psychological factors that drive social life. As the Greek etymology recalls, Psychology is an analytical discipline aiming to understand the soul in order to govern one's life creatively (whether one stands for an individual or for a collective). This discipline was born , like most contemporary sciences, in classical Greece some 2500 year ago. 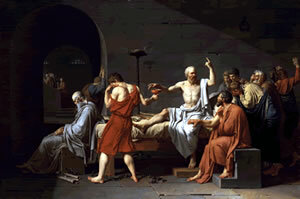 Socrates, the wisest teacher of mankind, is the father of Psychology; his maieutic method remains the clinical method per excellence if one wants to examine in depth any matter bearing on our human existence, whether this be a problem, a symptom or any other subject. Logically, this science or discipline of human life relies on the soul, namely on its highest faculty, the intellect. That is: in the human nature as a beings of language, endowed with the ability to speak and to think, and thus to examines one's life, a critical instance which distinguishes the human species from all animals or beasts. Therefore, contrary to the American fashionable beliefs such as Behaviorism (a pseudo science pursuing the totalitarian ideal of a programmable automata or a perfected bio idiotic clone), the real thing psychology operates with the human faculty of understanding, through speaking one's mind truthfully in order to get rid of any suffering or symptoms and to discover one's singular unconscious potential to fulfil your own vocation and to enjoy a good life. Maieutic: of or pertaining to the method used by Socrates of eliciting knowledge in the mind of a person by interrogation and insistence on close and logical reasoning. Read Plato's dialogues on Project Gutemberg : The Apology of Socrates, etc.